As a result of study requested by PHNDC in conjunction with the North Flatbush BID, Brooklyn DOT is planning safety improvements to the intersection of Flatbush Avenue, Carlton Avenue, and Park Place. The intersection has long been perceived by area residents as dangerous for pedestrians. DOT's plan uses pavement markings and flexible bollards to channelize vehicles turning right from Flatbush Avenue onto Carlton Avenue. It is hoped that vehicle turning speeds will be reduced as a result. 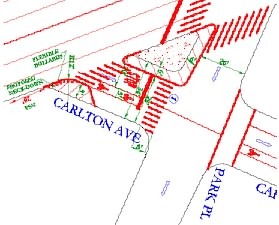 The corner of Flatbush Avenue and Carlton Avenue will be "daylighted" through the implementation of flexible bollards and a 20 foot No Standing Anytime zone, which should improve the "sight distance" that pedestrians crossing Carlton Avenue have of oncoming vehicles. Finally, it will be possible to implement two new marked crosswalks as a result of the changes here. The new markings and bollards are planned to be completed in the spring of 2009. A PDF of the plan is available here.